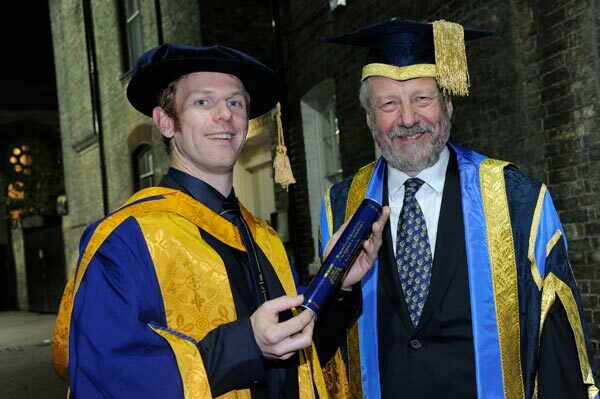 Paralympian Jody Cundy MBE was awarded an Honorary Doctorate from Anglia Ruskin University last week with a ceremony at the Corn Exchange in Cambridge. Cundy received his doctorate, in Health Sciences alongside other students from the university’s vice chancellor Professional Michael Thorne. “Jody is a Paralympic and world swimming and cycling champion, one of a very select group of elite athletes to win gold medals in two different sports. He is an inspiration to anyone seeking to overcome adversity,” said Professor Thorne. Tickets are still available for The Dave Rayner Fund Annual Dinner will be taking place at the Hilton Hotel in Bradford on November 10 at 6.30pm. Guests this year include Sean Kelly, Junior Road World Champion Lucy Garner, BMC’s Adam Blythe plus the Sky trio of Ben Swift, Ian Stannard and Luke Rowe . Hosting proceedings for the evening will be Eurosport’s David Harmon. Charity cyclist Austin Reynolds suffered from cruelly ironic bike theft last Friday when his limited edition Specialized Venge was stolen as he stopped for a coffee in Windsor. The thief rode off on the £9,000 bike, which equipped with Ultegra Di2 and a matt black paint finish. It was number 49 of a limited run of 200 models, and Reynolds is offering a reward for its return. Earlier this year Reynolds rode the Tour de Force, a ride which followed the exact route of the Tour de France one week in advance of the real thing. He raised over £20,000 for the William Wates Memorial Trust which aims to help young people at risk of falling into criminal activity. Former Newcastle United defender Robbie Elliot will set off next week on a 3,500 mile quest to raise money for the Sir Bobby Robson Foundation and Breakthrough Breast Cancer. Accompanied by triathlete and friend Phil Gray, the footballer will cycle between each of the clubs managed by the former Newcastle boss, Sir Bobby Robson, who passed away from cancer in 2009. Starting in Sporting Lisbon in Portugal, the pair will visit Porto, Barcelona, PSV Eindhoven. Ipswich, Fulham and Wembley (for Robson’s stint as England boss), before finishing at St James’ Park in Newcastle. Geordie duo Ant and Dec have got behind the ride, called ‘Bike for Bobby,’ and you can show your support on November 10 by taking part in a 33 mile sportive with Elliot on Gray as they make their way to their final destination: Newcastle’s home game against West Ham. Following the success of the inaugural Etape Pennines sportive last weekend, Durham County Council has launched a new website aimed at promoting the cycling and walking opportunities in the region. Visitors can discover routes to suit all abilities as well as information on nearby attractions, while accommodation can also be booked through the site. County Durham includes a large section of the C2C cycle route, which bisects the Pennines from Workington in Cumbria to Whitehaven on the North Sea coast, but also boasts majestic roads over the Durham Dales and superb mountain bike facilities at Hamsterley forest. Head to www.thisisdurham.com/outdoors to see for yourself. 30 serving and former soldiers successfully arrived at the Cutty Sark in Greenwich yesterday after completing the six day Soldier Ride UK through East Anglia. Riding a mix of adapted bikes, handbikes, or off the peg road bikes, the group were waved on their way by The Duke of Edinburgh Prince Phillip last Saturday as they set off from the royal Sandringham Estate. A collaboration between three soldier’s charities – ABF The Soldier’s Charity, BLESMA, and Wounded Warrior Project – the Soldier Ride is in its second year in the UK after a number of successful rides in the USA. “The guys on hand bikes had to work extra hard work on some of the hills, but we all helped each other along and didn’t leave anyone behind,” said Pat Provis, who lost his left arm and most of his right hand in an explosion while serving in Northern Ireland.